Review posted February 19 2015. 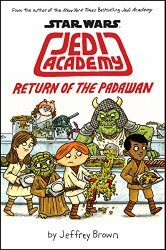 This is the second book in the Star Wars Jedi Academy series. Roan is back, ready and confident for his second year at Jedi Academy. At last he'll get to take Jedi pilot training! And he already has friends! But the pilot instructor doesn't seem to like Roan after the flight simulator almost blows up on his first flight. And things go wrong with his friends. The girl he likes hardly talks to him. Basically, he's got all sorts of regular middle school problems -- only they're happening at Jedi Academy. And Roan's a budding cartoonist, so the text never gets long and involved and is always broken up with comics. I haven't seen the first volume of this series on the shelf much since it was published (always checked out), and I am sure the same will be true for this one. And at the back, Roan gives tips for making your own comics.